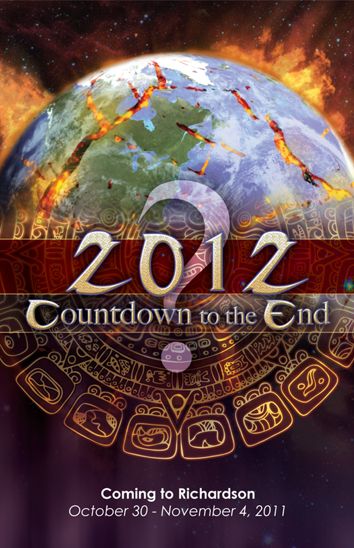 Did you enjoy the “2012- Countdown to the End?” series, or wish you had been able to attend more of the meetings? Click here to find video recordings of the meetings. The series will continue with additional Bible Prophecy topics on Wednesday nights from 7-8pm in the Richardson Seventh-day Adventist Church Sanctuary (1201. W. Belt Line Rd. Richardson, TX 75080). Invite your friends to join you for a mid-week spiritual boost, including time for singing, prayer and study of vital Bible prophecies for the last days we are living in. Wed. Nov. 9 “The Longest Time Prophecy in the Bible- 2,300 Years”- Why it is Important to Understand! Wed. Nov 16 “The Little Horn Power of Daniel 7”- Why God Warned Us It Was Coming. Wed. Dec 14 “Armageddon and the Seven Last Plagues”- It’s Too Late Change When They Start to Fall.